As the global auto industry enters a phase of restructuring, global auto executives named connectivity and digitisation the number one automotive trend in the 20th KPMG Global Automotive Executive Survey (GAES). The survey overwhelmingly showed that executives believe a shift in the industry is imminent and players will need to build on core competencies while defining a new role for themselves beyond traditional expertise. However, the results also show that most executives show little fear that auto company profitability will decrease. KPMG warns, though, that profitability will decrease as Original Equipment Manufacturers (OEMs) will soon be confronted with tough market conditions and shrinking global markets if they don’t act now to prepare for the industry of tomorrow. Execs globally believe in a fairly even split of BEVs (30%), hybrids (25%), FCEVs (23%) and ICEs (23%) by 2040 – with BEVs taking the lead. And consumers say “no” to fully alternative drivetrain technologies, with hybrids the number one choice for a consumer’s next car choice and ICEs closely following. The expectations for a mobility and logistics ecosystem are increasing: more than ever before, executives agree (60%) that in future we will no longer differentiate between the transportation of human and goods. Becker said: “One thing is clear: no player will be able to manage it alone. There is awareness among executives, with 83% agreeing that with the emergence of what we are calling mobi-listics, companies will need to both re-think their business model and also recognise the need for cooperation to create a mobility ecosystem. 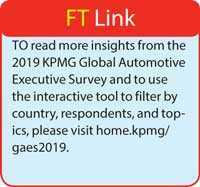 The company offering the best customer experience to people and goods will likely own the platform.” To read more insights from the 2019 KPMG Global Automotive Executive Survey and to use the interactive tool to filter by country, respondents, and topics, please visit home.kpmg/gaes2019.